Governor Akinwunmi Ambode presenting a cheque to Onibaba Community Development Association in Ifelodun LGA. “Today’s occasion is historic; we are presenting financial support of N500million Grant to 275 Community Development Associations to enable them complete their various self-help projects which had been executed to an appreciable level. Let me emphasise that this will be a continuous exercise. Other deserving Community Development Associations will also be considered in the next phase of this presentation,” the Governor said. 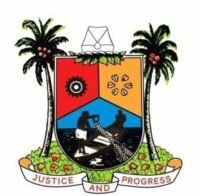 Alluding to the fact that the gesture was the first of its kind in the State, Governor Ambode said that beyond the 275 projects being supported, all the divisions of the State have been covered. 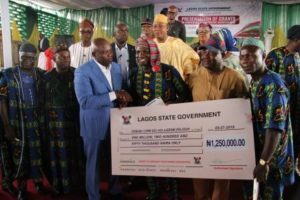 Earlier, State Chairman of the All Progressives Congress (APC), Alhaji Tunde Balogun, in his remarks, described the gesture by Governor as unprecedented in the history of Nigeria, urging community leaders and residents to make judicious use of the projects as well as prudent spending of the grants.